Welcome to the website of the Aviation PhotoCrew, specialized in high quality aviation photography and Air-to-Air photowork in particular. We hope to please you with our images while you fly through our website and hopefully we'll meet one day high in the skies. On the homepage you can find news about our projects and the latest reports published on our website. On the left side you can find the photo reports we made during the years. Please have a look at our port-folios and our services we offer to help you with your aviation photography needs. We hope you enjoy our work and bring our website a visit as it will be updated regularly with stunning photo reports. The Aviation PhotoCrew is a small team of enthusiastic photographers with the same passion for aviation. In the past years we have had the opportunity to do a lot of Air-to-Air photowork all around Europe, which can be found in the galleries on our website. 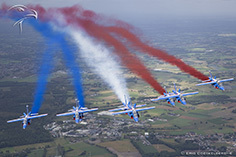 Sure you know what RIAT is all about, for the Aviation PhotoCrew it is the biggest project of the season. We are very privileged to fly a lot of photomissions all across Europe, and most of them are great and superb, but in terms of ‘BIG’ the photoflights in the week of the Royal International Air Tattoo are on top! 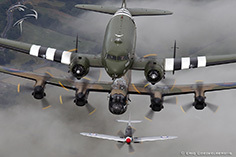 BBMF, the "Battle of Britain Memorial Flight" is the part of the Royal Air Force keeping some of the alltime iconic British warbirds alive, along with aircraft that flew in World War II. For the 2018 season, the BBMF is flying a rather huge formation called "Trenchard" with their C-47, Lancaster, 3 Spitfires and 2 Hurricanes. How fantastic and unique would it be to see that formation in the air...and that's exactly the once in a lifetime opportunity the Aviation PhotoCrew got on the day before the RIAT photomissions. 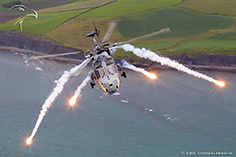 The prime PR-event of the Royal Navy has been for many years the airshow at NAS Yeovilton. 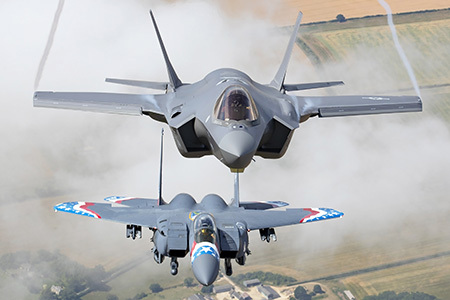 It is one of the most important airshows in the UK and each year again they manage to get some really special participants. The Aviation PhotoCrew is enjoying a longstanding excellent relationship with the airshow team, and so it was our job again to provide all the Air-to-Air photowork. The weather was no challenge this time, although a tropical 30+ °C all the time is not ideal either. For many pilots and aircraft owners Duxford airfield is a kinda ‘special’ airfield. They have several additional flight regulations, and most of all ( as we could experience first hand ) it is outreageously expensive to operate from its grounds. 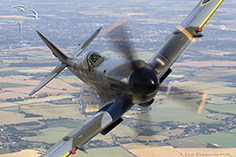 Of course that is just a sidenote, as it is also home to some of the most exclusive warbird collections in the world, and we were the lucky team to organise a photomission with some of those iconic birds. Early july our team embarked to the UK for a few very exciting weeks, flying 4 projects in a row! Busy 10th anniversary season. To fly a dedicated photomossion with the sole flying B-17 in Europe has been a wish for many years, and after a small taste to see a Flying Fortress next to the Skyvan photoship in 2016, the desire to see this magnificent aircraft from all angles only got bigger. 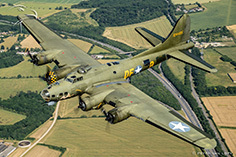 Elly Sallingboe and her team have achieved an incredible challenge to keep the B-17 flying in the European skies, not just for a few years, but for decades in a row! Our final project in the Scandinavian tour brought us to the airbase of Jyvaskyla, our longest way from home so far! 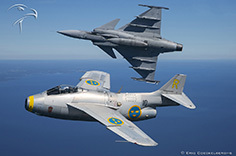 The Finnish Air Force was to celebrate its 100th anniversary, but not by inviting a load of other Air Forces. 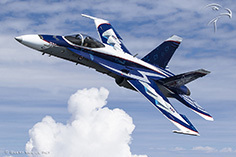 Instead they focused on all the flying assets the Finnish Air Force had and has to offer, along with a presentation of the newest jetfighters taking part in the contest to replace the current F-18’s. that combination made this airshow very interesting for us, as we would have a chance to see some aircraft join up on the Skyvan photoship that hardly go out of Finnish airspace. 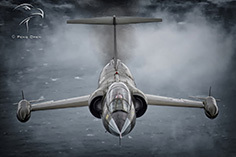 One of the highlights of our tenth season, was shooting the only airworthy F-104 Starfighter in Europe over Denmark’s Kattegat. The Starfighter is an iconic aircraft that was operational in abundant numbers when some of the older members of the Aviation PhotoCrew grew up. 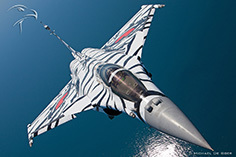 During the first half of the 1980s it was replaced mainly by the F-16, but it left an ever lasting impression on all of us that experienced the long smoke trails, the howling of the J-79 engine in the circuit and the Starfighter’s aerodynamic shape with its long fuselage, short wings and T-tail. And it didn’t disappoint in real life, doing passes past our Skyvan! In the 2016 season we spend a fantastic day at the famous airbase in North Germany, with the aim to see the iconic A-4 Skyhawk flying a formation with the Eurofighter. After two successful flights we promised to come back, and so our 2018 season opened with another project at Wittmund. This time the mood was a bit different, a mixture between sad and super excited as we knew that this would be thé final chance ever to see the A-4 Skyhawks flying in European airspace. When the ‘little’ worldfamous airshow of Sanicole is celebrating it’s 40th anniversary you can expect a pretty good airshow…but it’s always a really good airshow, so how do you celebrate in style? To make it a super brilliant airshow of course! Needless to say that the photoflights would be set at the same level. We were looking forward to return to Yeovilton, as we enjoy a superb corporation with the Royal Navy and the airshow team. 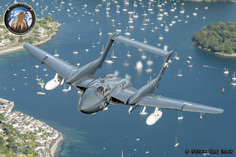 Unfortunately one of our main targets – the sole flying Sea Vixen in the world – made a belly landing just weeks before the airshow, and so ended a dream of many photographers to see this magnificent aircraft air to air. The other target that everyone wanted was an ultra rare species of a white Tiger! Since the French Marine was host of the TigerMeet in june of this year, one of their Rafales was adorned with a superhot tigerschedule and we were waiting for them of course along the great coastal area. The Rafales did not disappoint, and gave us two incredible photo join-ups. Open the gates of aviation paradise…and let your memorycards be filled with superb shots of participating aircraft, teams and helicopters….welcome to RIAT 2017! Where do we begin with such a giant program of all incredible aircraft posing for us, one after the other….well, we were airborne for 16+ hours just for the photos! As Sanicole is also the place where we shaped the success of the Aviation PhotoCrew, our longtime partnership for the air to air photomissions are a guaranteed success. 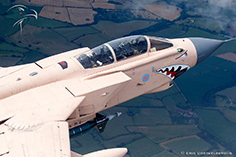 RIAT, Royal International Air Tattoo…..does this airshow really needs an introduction? Well if you don’t know, it is the worlds biggest and most famous military airshow! With our Aviation PhotoCrew, we were more than priviledged to fly the photomissions, and for our preparations we teamed up with our friends from COAP. 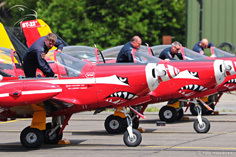 Yeovilton Air Station is the primary airbase for the Royal Navy, host for the annual Air Day. It’s a major airshow in Europe with participants from many different countries, and what’s special about the Air Day is that they manage to attract each year a few aircraft that are absolutely unique. Continuing our solid corporation from previous year, the Aviation PhotoCrew hosted a team of photographers joining us for the naval adventures. 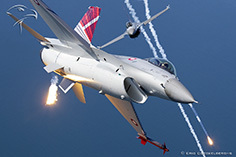 The Aviation PhotoCrew was privileged to have for the first time an extensive corporation with the Danish Air Force, on the occasion of their bi-annual airshow. The location was their main fighter base Skrydstrup, we would fly the Skyvan photoship from the nearby Sonderborg airfield. The photo area we had chosen was along the coastline, to include some of the beautiful backdrop Denmark has to offer. 2016 Marked the last year for a very large airshow in Dutch airspace, as the Air Force will only host a new airshow once every two, three years. So this edition of the ‘Open Dagen’ was certainly one where the public would have a blast with the offered program. Thé highlight of course was the first presentation of the Lockheed F-35, not the ugly mock-up, but the first two real aircraft who flew over from the USA. And so we were ready and excited to fly the Skyvan photoship to catch up with them!! 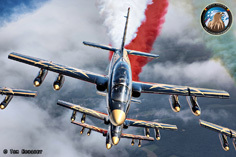 On May 16th, the Belgian Air Force presented their demonstration teams for the upcoming Airshow season. 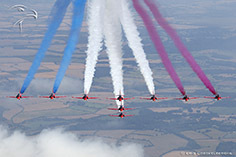 Three teams were showcased at the Beauvechain Air Base, the “Red Devils”, “A-109 Display Team” and the “F-16 Solo Display Team”. In 2016, the Belgian Air Force Days took place at Florennes AB over the weekend of June 25-26. 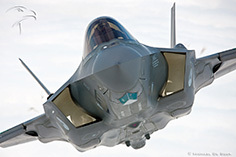 During the event the 70th anniversary of the Belgian Air Force was celebrated. 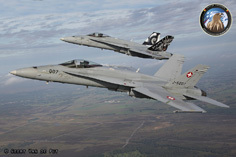 The organization attracted a lot of participating aircraft to the show coming from all over Europe. 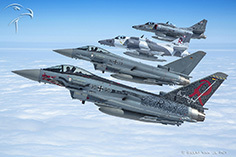 Wittmund Air Base in Northern Germany is home of the famous Taktisches Lufftwaffengeschwader 71 “Richthofen” Squadron. 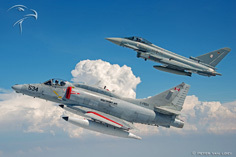 Since the retirement of the F-4 Phantoms in 2013, the Squadron successfully transitioned to the Eurofighter. The base also houses a detachment of Discovery Air Defence, a company specialized in providing military training services. They operate a fleet of seven A-4N Skyhawks contracted to the German Air Force, Army and Navy. 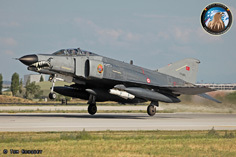 Konya Air Base in Central Turkey is well know being the home of the national demonstration team “Turkish Stars” and being the host of the “Anatolian Eagle” exercise. The international Anatolian Eagle 2016-2 exercise was organized from May 30th- June 10. During the exercise two missions were flown every day with one morning wave and an afternoon wave, each with up to 60 aircraft involved in the exercise. The exercise was attended by 7 participating Forces; Turkish Air Force, Turkish Navy, Italian Air Force, Royal Netherland Air Force, Pakistan Air Force, Royal Saudi Arabian Air Force and NATO. The 2016 edition of the EAC Convention took place at Malta. 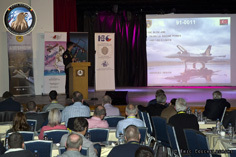 The annual convention was held from March 3-5. As usual the actual convention started on Friday with the introductions and opening address by EAC Executive, Charles Skiera and EAC Chairman, Gilbert Buekenberghs. The more than 200 guests (a record) were then welcomed by the minister of tourism and aviation, Edward Zammit Lewis. 2015 saw the Vulcan XH558 flying it’s very last Airshow season. 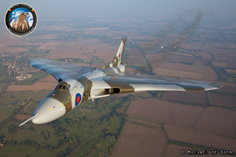 Since 2007 the mighty AVRO Vulcan returned to the Airshow scene thanks to the great effort made by the Vulcan to the Sky Trust and the thousands of people who supported the project. Dubbed “The Spirit of Great-Britain”, she safely flew 250 Hrs in the skies above Great Britain, showing her grace to millions of people. During the past years, the Vulcan really impressed and was a highlight on every Airshow she visited, it was called the “Vulcan-Effect”. The Aviation-PhotoCrew was honored to fly several times with the Vulcan, and 2015 we had the great pleasure to fly with here on three unique occasions. 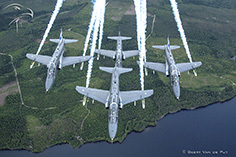 The USAF Heritage Flight Foundation provides 40–60 annual demonstrations at events ranging from open houses and airshows to sporting events, parades and funerals. 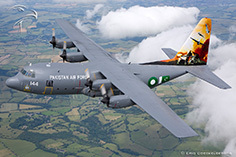 Heritage Flights seek to honor the contributions of every man and woman who has served in the USAF while educating the general public on the importance of the USAF and its mission. The 2016 Heritage Flight Training and Certification Course took place at Davis-Monthan AFB in Tucson (Arizona), March 3-6. The qualification course provides the civilian and military pilots the opportunity to safely fly in formation to prepare for their upcoming airshow season. 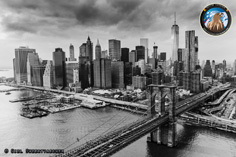 Last year we had the tremendous idea to celebrate new years eve in the city that never sleeps, the big apple, … You’ve guessed it right: New York. Our plan was to do a helicopter flight with the famous FlyNYON. early in the week. This way we could see the ball drop on Times Square on new years eve. Thing turned out differently! Culdrose was a first time for the Aviation Photocrew and was remarkable in many ways.The Air Station is one of the major home bases of the Royal Navy, located in the idyllic Cornwall region.The main goal of this trip was to catch the only airworthy Sea Vixen, but we got to see much more. From Wednesday September 16th till Monday September 21st, the Aviation Photocrew organized the sixth Air-to-Air Academy during the 38th International Sanicole Airshow and the Spottersday at Kleine-Brogel. Staging out of Zwartberg Municipal Airport just south of Kleine-Brogel Air Base, a total of 12 photo-flights were made, in close cooperation with the Belgian Air Force and the airshow organizers. 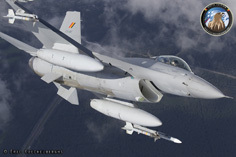 Kleine-Brogel is one of two home bases of the F-16 fleet of the Belgian Air Force. It houses two operational Squadrons (31 and 349 Sqn) and the Operational Conversion Unit. 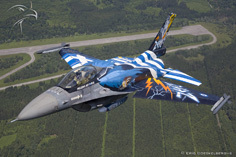 Currently four F-16’s wear a special color-scheme, one for each Squadron plus the F-16 demo aircraft. 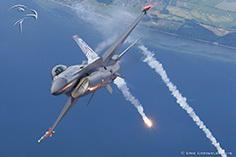 This photoreport is overloaded with F-16's in many different colors. 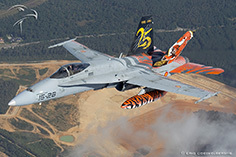 It took us some time, but the extensive report on the Belgian Air Force Days 2014 is now online. Over the period of six days, a whole array of aircraft and helicopters came posing behind the Skyvan photoship. 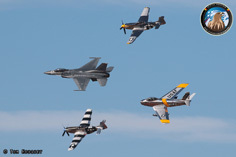 This resulted in a big collection of great images, summarizing the huge success of the Airshow.